In November, Jorge dropped me a line to let me know that the Bull sharks were starting to come back for the new season (they come for a few months in the winter). We made plans to try again, hoping that the fishermen would leave the sharks alone. Last week, Cameraman Tim and my lovely wife Christine (serving as production manager on the shoot in addition to being the series executive producer) packed our bags and flew back down to the Riviera Maya to meet Jorge, Charlie and the rest of the gang from Phantom Divers. Our first day on the water was pretty darned rough. 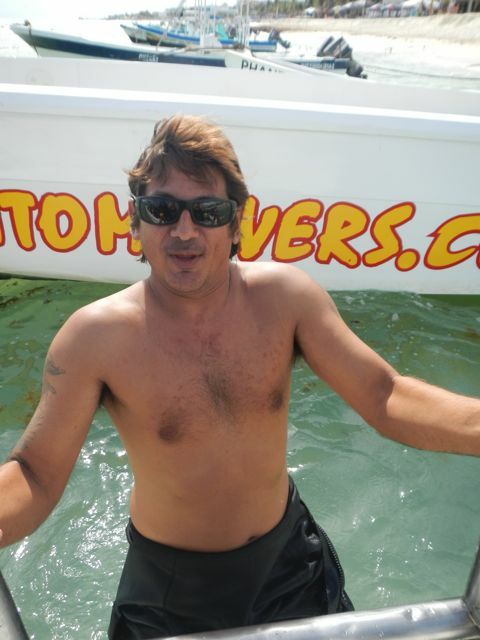 At one point Jorge told us to hurry up and get off the boat before we had a wreck dive! On the bottom, the current was pretty strong. A few sharks circled in the distance, but they weren’t coming in close. We didn’t get any shots. I was feeling a little bummed out, but Jorge assured me that the afternoons are usually better. After lunch, we tried again. The water was even more rough, but the current had diminished a bit. This time the sharks did come in and feed, and we got some pretty good shots of Jorge and Charlie feeding the Bulls by hand. They wear full chain mail suits “just in case” as the sharks come in and grab the bait pretty quickly. You have to be careful to keep your fingers away from the sharks’ mouths when they grab that bait. 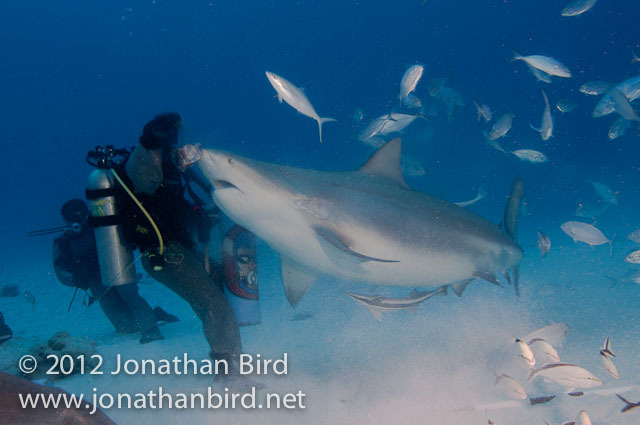 The sharks aren’t intentionally aggressive towards the divers at all, but they do love those pieces of fish. Although for a shark that is reputed to be extremely aggressive, they are surprisingly timid around divers. If the group doesn’t stay still on the bottom, it spooks the sharks and they don’t come close. We had another interesting bit of luck. A Mexican shark biologist named Mauricio Padilla was visiting this week as well. Turns out we met each other back in 2005 in Guadalupe. 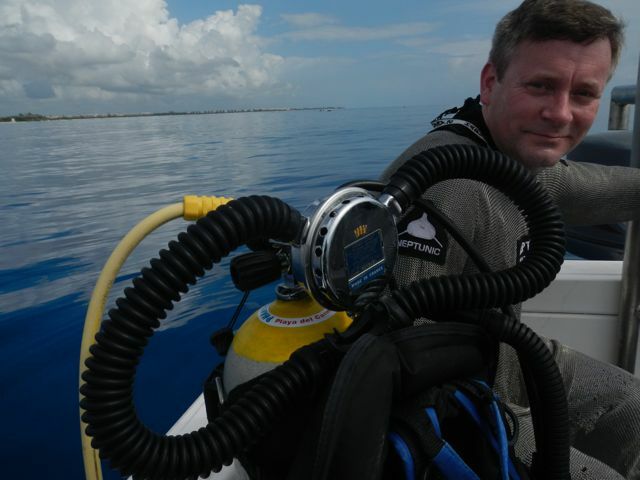 He is the head Great White shark research biologist out there. 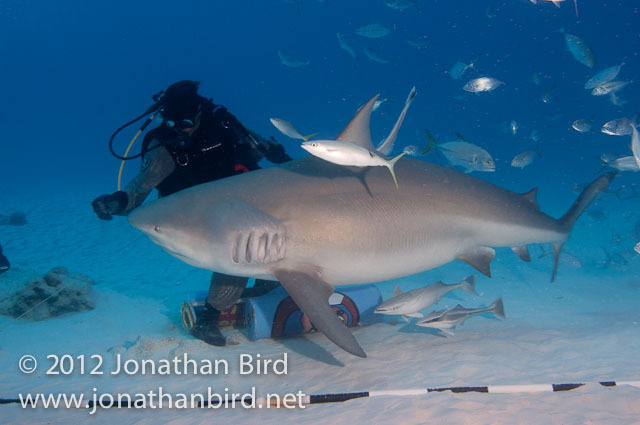 He is now working on a Bull shark study as well, and trying to get some tissue samples for DNA analysis. So we hoped to work his research into our story. 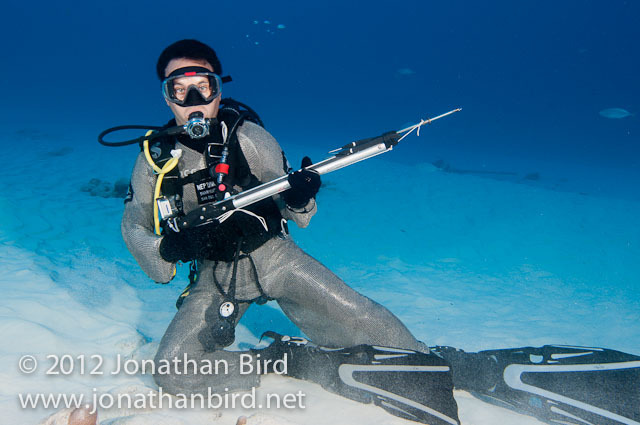 He has a big speargun with a hollow tip for taking tissue samples. It doesn’t hurt the shark—just takes a tiny plug of skin and muscle for DNA analysis. We hoped to film him getting samples, but so far he has only managed to get 11 samples of Bull sharks so we would need to be pretty lucky to film that. The next day, we arranged for me to try feeding. (Sometimes I get to do pretty cool stuff for the show!) Of course that meant suiting up in a chain mail suit. Between Jorge, Charlie, Mauricio and me, we had quite a team of chain mail-wearing divers! We staged a funny shot for the segment—a parody of the slow-motion shot of the walking team of astronauts in the film Armageddon. It will be hilarious. The chain mail suit weighs something like 30 pounds, so you don’t need a weightbelt, and if you drop into the water without your BC inflated, you will sink like a rock. In fact, the suit can be dangerous. If you were to fall overboard wearing the suit, you would not be able to swim—you would sink straight to the bottom and drown. Not a good feeling on a boat. Anyway, we boarded the boat and headed out. The day was perfectly flat calm, so we took advantage of that for some surface shots. Once we got in the water, we found the current strong and the sharks only mildly interested. They came close but seemed skittish about eating. We got good B-roll, but I didn’t succeed in hand-feeding the Bulls. We would try again in the afternoon because we needed that shot for the segment. Since Jorge doesn’t want to freak out beach-goers by feeding sharks too close to the shore, he does his shark feed plenty far from the beach in 80 feet of water. 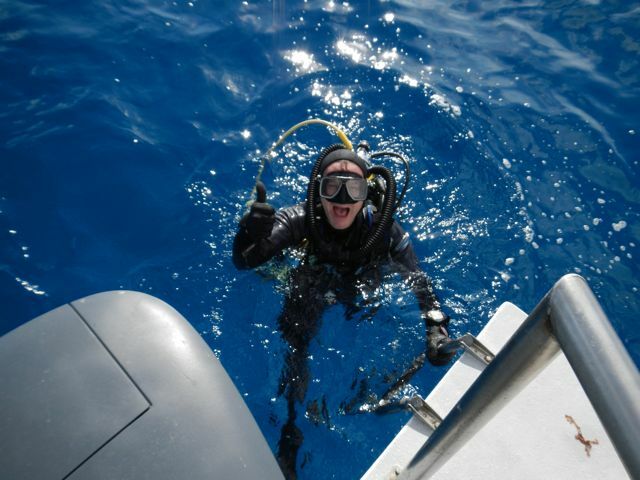 It’s a little deeper than ideal for shark diving as it limits the bottom time, and put restraints on the quality of light. As a result, we used 32% nitrox to extend bottom times. Even then, we were only getting about 30 minutes on the bottom. We often found that the sharks were just getting adventurous by the time we left. Jorge said that in November and December there are a lot more sharks, and the feeding can get very exciting, almost to the point of having too many sharks. But in January, the really big (presumably pregnant) sharks vanish. He is pretty sure they go to have their pups in shallow water someplace. He and Mauricio are going to put sonic tags on them soon to see if they can figure out where they are going. They are already putting receivers to track the tags in various places where Bull sharks are thought to be pupping. 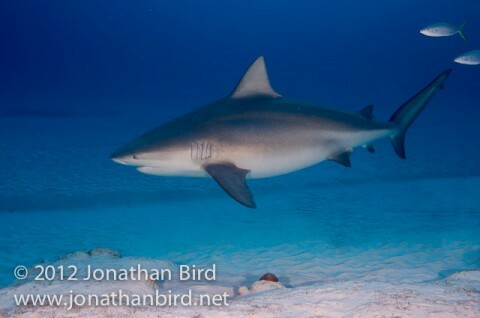 Curiously, all the Bull sharks that show up in Playa del Carmen are female. We didn’t see a single male. Very interesting! In the afternoon we headed out again for my second try at hand feeding. To hedge our bets a little, we sent Charlie down 15 minutes before us to chum in advance. He sent up a float a few minutes later to tell us the sharks were ready. When we got down there, Charlie had the sharks in a flurry of activity. I swam right up to him and took over feeding. I had a really huge female taking fish after fish from my hand! 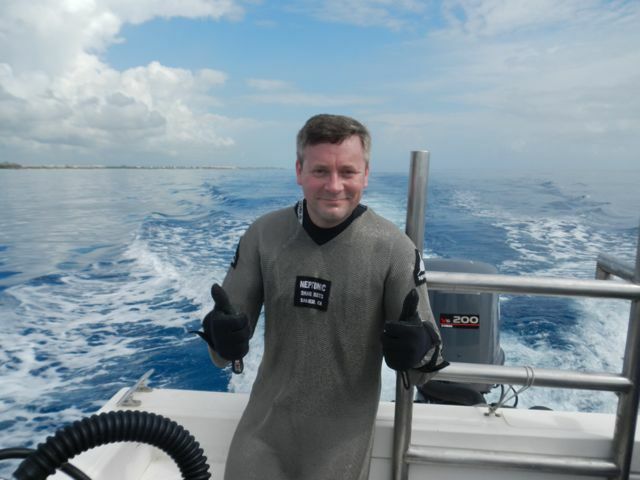 And even though I had fed plenty of sharks before, I was glad to have the chain mail on—just in case! 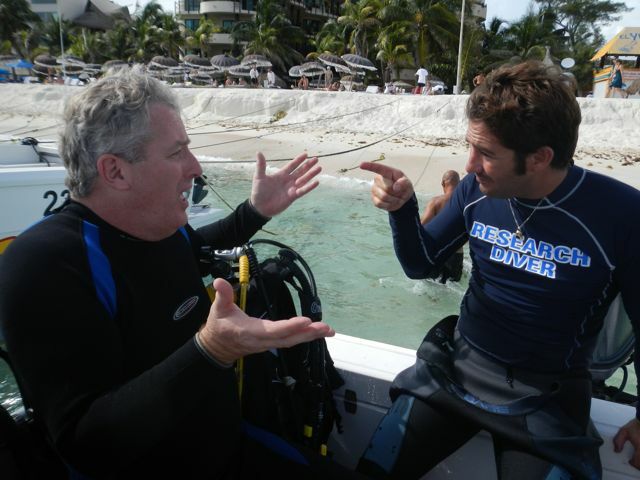 Once we had enough shots of me feeding the sharks, it was time to let Mauricio have a go at taking a tissue sample. I grabbed my video camera from Christine to film it along with Cameraman Tim. The big female that was monopolizing the feeding had already been sampled a few weeks ago, so Mauricio was waiting for one of the smaller ones to come within range. Because the skin on the Bull shark is so tough, Mauricio has to be within 3 feet of the shark for the speargun to carry enough force to take the sample. 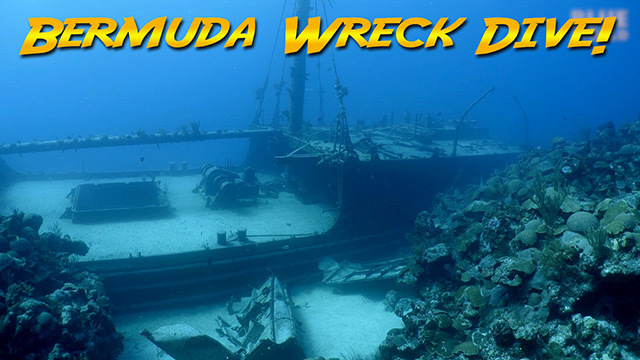 We didn’t think it was going to happen, but towards the very end of the dive, the right shark came in close. Cameraman Tim and I were both in position and filmed Mauricio taking a perfect tissue sample. Mauricio even had a GoPro camera mounted on his speargun as a “gun camera” so we have three angles on it. On the third day, I planned to just shoot some B-roll of swimming sharks. The morning was again a little frustrating. This time we had almost no sharks in range the whole dive and we got pretty much nothing. I left the last dive as my only opportunity to shoot a few stills. Christine volunteered to shoot some B-roll of shark cutaways so I could take my still camera in the water for one dive before heading home. We got lucky with pretty good shark action on the last dive and even though I didn’t produce anything utterly spectacular with the still camera, I got a few pictures to share. After only three days of shooting, we packed our bags to come home. I wish we could have stayed a few more days, but we had to get home. It was a short trip, but we nailed a fabulous segment. I can’t wait to start editing! 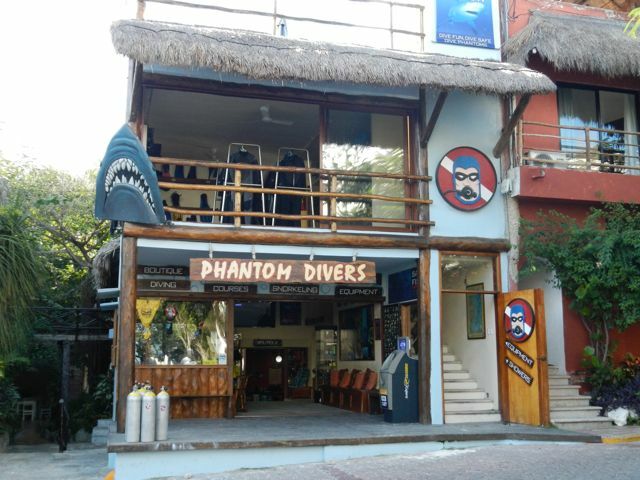 We would like to thank Phantom Divers for hosting us, The Riviera Maya Tourism Board for their invaluable assistance and the Blue Parrot 5th Ave hotel. 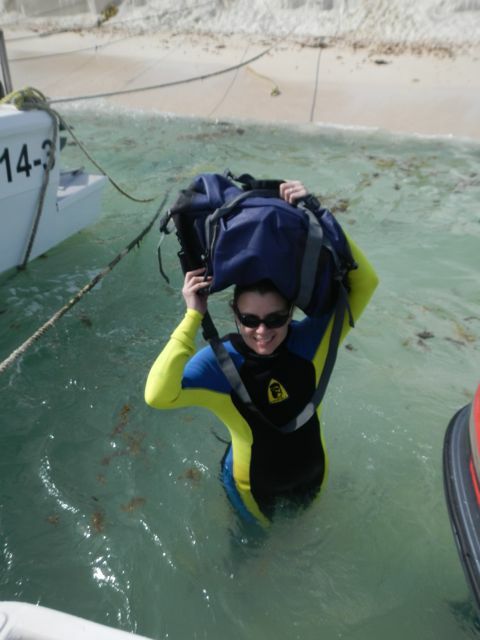 This was my fifth trip to Playa del Carmen for various underwater exploits and I’m sure I’ll be back again!